Pilon’s Pig (translated by Jamie Chang) is a story from the 1980s which takes place over a short period of time in one carriage of a train. Lee, a soldier who has completed his three years of national service, is on his way home but, owing to a lack of money, reluctantly decides to take the military train. He immediately regrets his decision when he bumps into Hong, a slightly dim-witted man with whom he did his initial training, yet that’s nothing to what happens once the train gets going. Nonetheless, Hong chattered on excitedly. Listening to Hong’s story, which was likely fabricated by stringing other soldiers’ anecdotes together, Lee noticed how much Hong had changed. Rather than being impressed by the life skills Hong picked up in the army, Lee lamented the transformation of an innocent farmer into a mediocre crook. Lee, who mostly worked in an office towards the end of his army stint, looks down on a colleague who is proud to have bludged his way through his service. Despite the aggressive nature of the newcomers, the reality is that it’s just a handful of marines against a hundred men. Will the newly-discharged soldiers rise up? What will happen if they do? 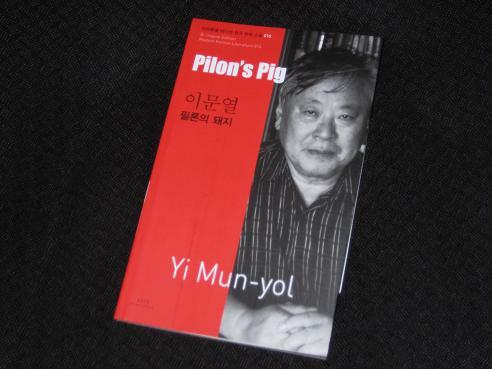 Of course, Pilon’s Pig isn’t really about the men in the train, but rather another allegory of Korean society in the 1980s, a tale examining the reality of tyranny of the few over the many. Lee, the typical everyman, is positioned as a witness to the (social) turmoil, knowing that the military police will only turn up when it’s too late. Surprisingly, the idea here is not really to support the uprising but to wonder whether it’s better to just keep your head down and not make waves. It’s a shortish story, but well-told and thought-provoking, doing what it set out to do and finishing before it outstays its welcome. It’s helped by Chang’s translation, one of the better ones I’ve read from this early series (where the translations haven’t always been as smooth as in the later K-Fiction series). There’s a fairly American feel to the dialogue, with Chang making an interesting choice in conveying Hong’s country accent (as you may have noticed in the first quotation I featured…). As always, there’s also an interesting afterword, particularly so when it comes to the writer’s biography. Yi is seen as a conservative writer (for which he has been heavily criticised), and this bio helps to explain why that is, with much made of his father’s defection to the North while the writer was still a young child. ← Do Not Adjust Your Sets!